Hospitals are shaping always-on consumer experiences with cutting-edge digital health tools as well as scheduling apps, workflow tools and more ways to access care. Patient engagement and user experience is a goal high on the priority list for many hospitals and health systems that wish to enhance communication with consumers, better include patients in their care decisions and ultimately improve outcomes. Information technology can help caregivers on the front lines of healthcare better engage people to nail down these ambitions. And the next generation of patient engagement IT will offer better and new tools and approaches to help caregivers and others aim high and hit the mark. Better bidirectional messaging with members of a patient’s care team is a next-generation feature of patient engagement technology, said Brian Eastwood, an analyst at Chilmark Research, a healthcare IT consulting firm. "Messaging also provides a way for patients to ask low-acuity care questions directly to their care team, instead of seeking out telehealth, retail health or urgent care options." 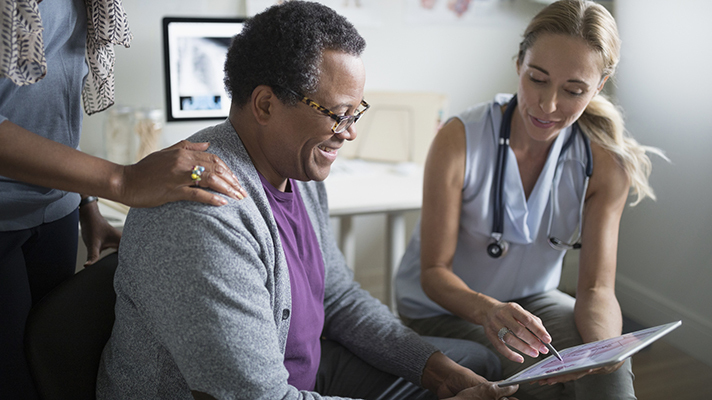 This can reduce the gaps that appear in patient records when they seek care elsewhere, and it can help provider organizations retain patients who might otherwise seek care outside the provider’s network, he added. “Messaging complements the level of engagement necessary to support a provider’s larger care management and population heath management goals, which often rely on frequent communication to help patients avoid 30-day hospital readmissions or achieve care plan goals tied to clinical outcomes,” Eastwood explained. The next generation of consumer health will empower patients to look beyond the portal and be a proactive participant in their health and well-being, and digital technology will provide consumers with a comprehensive view of the health and well-being journey from birth, regardless of geographic location, said David Harse, vice president and general manager of consumer engagement at Cerner. It will support consumers in viewing their personal information, and use applications and technologies to upload and add to their personal health record, Harse added. Next generation consumer health engagement strategies will strategically use predictive and artificial intelligence to create authentic and contextual consumer experiences that provide “always on” engagement, Harse added. Predictive intelligence will help organizations to use consumer data insights and behavioral trends to anticipate a consumer’s needs and intent to deliver personalized, targeted messaging and content at the right time using the consumer’s modality of choice, he said. "AI will support organizations in providing consumers self-service communities and automated assistants, resulting in fewer touch-points and more expedient answers." When looking at patient engagement technology with an eye for what’s on the horizon, one must begin with the question of what problems need solving, what forces will guide innovation and subsequent solutions, said Joshua Newman, chief medical officer at Salesforce. The three biggest problems are the cost of care, the often terrible experience of the healthcare system and the ways lifestyle choices – arguably the most important factor of health – are often inaccessible to health providers, much less their technologies, processes and expertise, Newman said. One way to address cost is by coordinating across the ecosystem of providers and making delivery smoother, Newman said. The real innovation here is vertically organized groups that do insurance, acute care, ambulatory care, ancillary care and home health, he said. "Fortunately, because these kinds of things have been deployed in almost every other industry, they’re not so difficult to imagine." The technology here is aggregating across organizations and sharing workflows, he said. Where EHRs only really address a single organization, technologies like a healthcare cloud can bring together multiple parties, he added. On the experience front, few patients complain about their medicine, procedures or studies – everyone complains about scheduling, lack of cost transparency, lack of visibility into process, and the emotional toll of feeling disconnected and unsupported, Newman said. The problem of experience isn’t complex, it’s just that for so long, few cared about it – there’s a well-worn path to improve these things and it is coming to healthcare. Finally, with outcomes from lifestyle support and changes, this is the domain that will make the most impact on human health and society and it will grow directly from the above two, Newman said. Omni-channel messaging technology innovations will be well-known to the industry: Video, chat, e-mail, phone and more can give messages to those striving to make healthier choices and address mental health precursors of bad decisions, Newman said. And technology that supports caring for older people with chronic and terminal conditions, such as end-stage kidney, heart or lung disease as well as dementia and other cognitive diseases, will help these people, he said. "As a foundational step for next generation patient engagement, healthcare providers must anchor a patient engagement solution with a holistic and omnichannel identity graph." On another next-generation patient engagement front, the amount of data being generated under the umbrella of health and wellness is staggering, and connecting providers to their community at the right time, in the right way, and with the right message and value is critical, said Heidi West, vice president of healthcare, Acxiom marketing solutions, at Acxiom. Resources available in multiple languages and formats will be crucial to next-generation patient engagement efforts, said Eastwood of Chilmark Research. On the back end, applications should be able to monitor patients’ progress, either by tracking the resources that patients have viewed or by quizzing patients on the information that has been presented to them; this way, care teams can make changes to the resources that they share or even the care plan goals that they have set, he concluded.